>I just finished the project I’ve been working on this month for the shop and I’m pleased to announce my newest multisize pattern! This pattern comes in two different size packs- from size 30 to 40 inch chest and is now available for purchase in my Etsy store! 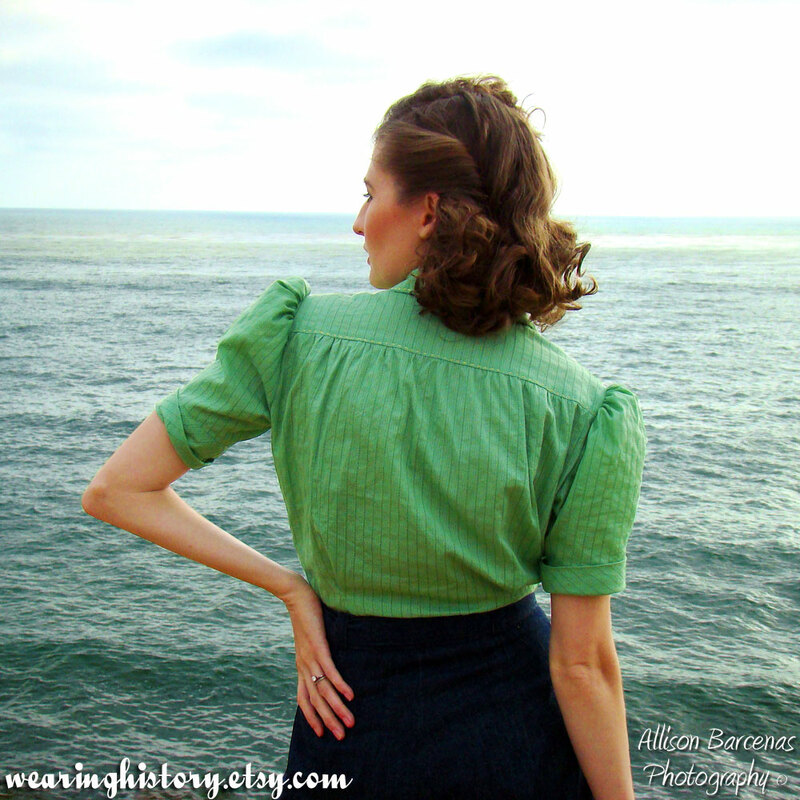 This pattern is for the perfect casual vintage ensemble- for dancing, wearing about town, and anywhere you want to take them- tailored enough to be dressy but casual enough to go anywhere! This design is inspired by the mid to late 1930s. It works well for looks from 1935 to 1939, but can look just as chic when mixed in with modern basics. The yoked blouse has short puffed sleeves with cuffs that are cut on the bias. It has a self facing and buttons up the front. 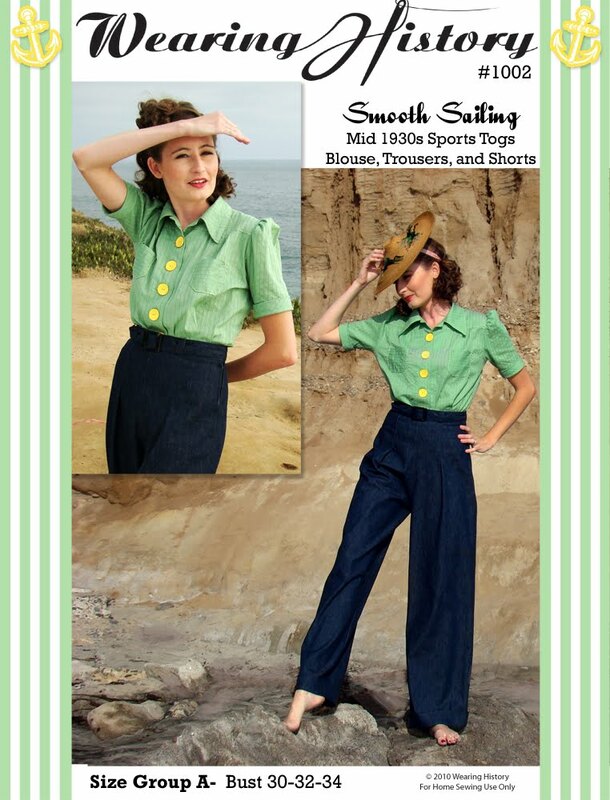 It provides the perfect background for fun buttons, and the cut is fitted at the waist but loose at top. It’s perfect for prints or solids! The front can be buttoned all the way up to the neck or the top buttons can be left off to make a notched collar. This Wearing History pattern was inspired by period sources from the 1930s. This pattern is multisize with three sizes per packet. 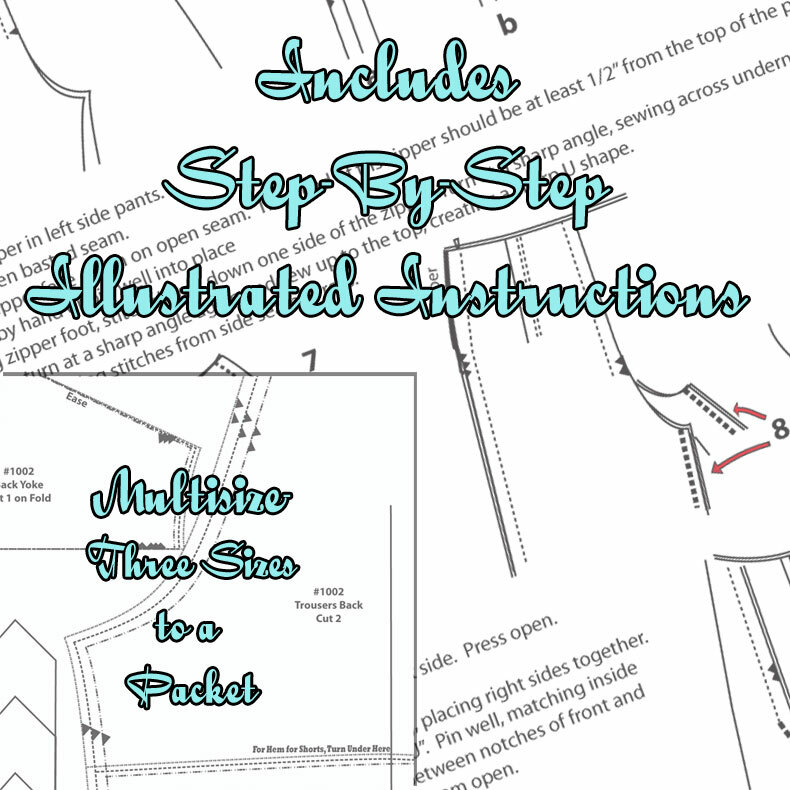 This pattern runs true to size and is meant to be very fitted at the waist. If you’re between sizes order the next size larger. >O_O It's fantastic ~ I love those trousers… I want to sew myself a pair like that, so when I am ready I think I will buy your pattern.Beautiful work!!xox,b. of Depict This! >I love everything about this pattern! (And I want the hat too!) Now if only I could get someone to sew it for me. :-)Just took peek at your other Wearing History patterns. They're all wonderful. >wonderful! By the way, you look glorious in green! >Oh, my goodness, this is exactly what I've been looking for! And the cuts are beautiful! Well done, you! >Fantastic! I love separates from the era. I must order soon. >Oooooh want. I'm impressed this is an original pattern, how exciting! >i love great separates and although I (sadly) do NOT sew, I might just buy this super pretty pattern and ask someone else to do it for me! >Another question : How does I order if I´m small upp (European 38) and big down (42) ? >Thank you so much, everyone! I'm so glad you all love the pattern :)Diva, if you're in between sizes you should order the largest as it's easier to take things in than let them out.Miriam, thank you so much! What a lovely post- I'm truly flattered :) I'll get your pattern out today! Hope you love it! The photographer is Allison Barcenas Photography. She's my cousin, and I'm so thrilled with her talent!